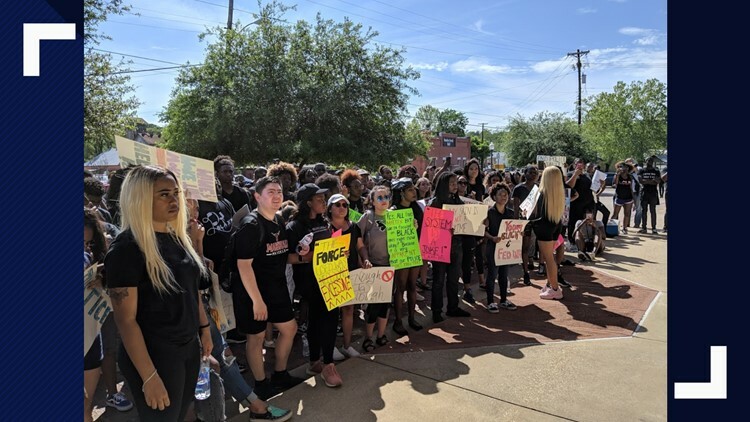 Stephen F. Austin students walked more than a mile on Tuesday demanding their voices to be heard after a video of an arrest in Nacogdoches went viral on social media. 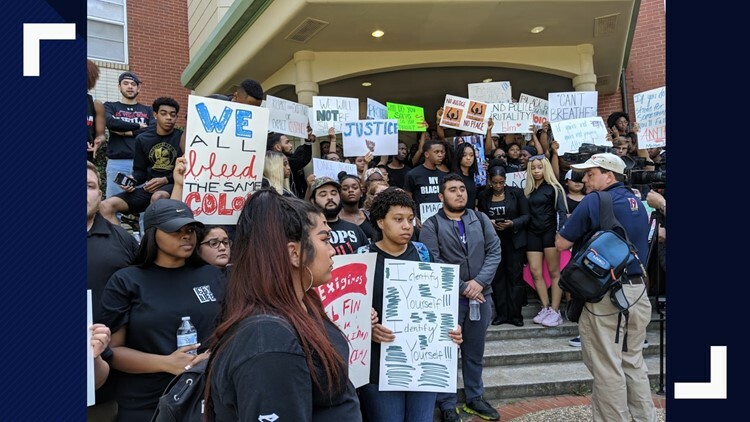 NACOGDOCHES, Texas — Stephen F. Austin students walked more than a mile on Tuesday demanding their voices to be heard after a video of an arrest in Nacogdoches went viral on social media. The students marched to the Nacogdoches Police Department with change in mind. The reaction comes after several videos appeared on social media, including one from the NPD, which showed two women in an altercation with an off-duty officer at The Overlook apartment complex on April 10. According to NPD, an off-duty officer, who was working security, came in contact with a large group of individuals in an apartment complex parking lot in the 1600 block of Cardinal Street while investigating a criminal trespassing incident. Officials say the officer is a courtesy officer who resides at the complex and is frequently relied upon to assist the complex with routine security matters. The NPD says the officer approached the group due to ongoing issues with trespassing, burglaries and other criminal issues at the facility. "During the incident the off-duty officer requested back up from on duty officers," the NPD said in a statement. "Multiple individuals refused orders to stay while the officer attempted to complete the investigation to determine if the group was trespassing." According to the NPD, during the incident, two women resisted arrest at different times, one of which ran away. The NPD says the officer, who has not been identified, was assaulted during the incident causing minor injuries. The officer was taken to an area hospital for treatment and later released. Police say Lindsey Ogbonna, 19, of Nacogdoches, was arrested during the investigation and charged with resisting arrest. "The criminal investigation into the assault on the officer is ongoing and further charges may come at a later time," police said in a press release. According to Ogbonna, the officer's actions and use of force made it difficult for she and her friend Shannon Williams to breathe. "My friend saying she can't breathe, she can't breathe for a second, you see me stop breathing and try to come back up," Ogbonna said. Ogbonna's attorney, Kim Coles, says the officer did more than just pin them down. "He literally ripped her top off and had her bare breast exposed and had his knee in her groin," Coles claimed. "She is bruised all up." This incident sparked outrage in many students which led them to protest in what they call an effort to seek justice for the women involved. Protesters are hoping officials will drop the charges against Ogbonna, Williams and a third unidentified person. They also want the officer to "face consequences for his actions"
"We will be here, we will be back, and if they don't get justice, they don't get peace," Coles said. Ogbonna is charged with criminal trespassing and could possibly face assault charges. Charges for Williams were not specified and a third person has been charged with evading arrest. "At the end of the day what I went through, my emotions will never be the same," Williams said. "My life will never be the same."